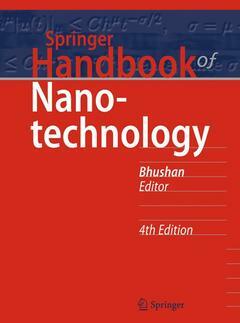 This comprehensive handbook has become the definitive reference work in the field of nanoscience and nanotechnology, and this 4th edition incorporates a number of recent new developments. It integrates nanofabrication, nanomaterials, nanodevices, nanomechanics, nanotribology, materials science, and reliability engineering knowledge in just one volume. Furthermore, it discusses various nanostructures; micro/nanofabrication; micro/nanodevices and biomicro/nanodevices, as well as scanning probe microscopy; nanotribology and nanomechanics; molecularly thick films; industrial applications and nanodevice reliability; societal, environmental, health and safety issues; and nanotechnology education. In this new edition, written by an international team of over 140 distinguished experts and put together by an experienced editor with a comprehensive understanding of the field, almost all the chapters are either new or substantially revised and expanded, with new topics of interest added. It is an essential resource for anyone working in the rapidly evolving field of key technology, including mechanical and electrical engineers, materials scientists, physicists, and chemists. Introduction to Nanotechnology.- Molecule-Based Devices.- Introduction to Micro-/Nanofabrication.- Three-Dimensional Nanostructure fabrication by Focused-Ion Beam, Electron Beam and Laser Beam.- Nanoimprint Lithography.- Stamping Techniques for Micro- and Nanofabrication.- Materials Aspects of Micro-and Nanoelectromechanical Systems.- Introduction to Carbon Nanotubes.- Nanowires.- Nanoribbons.- Nanoparticles and Applications in Nanotechnology.- Graphene.- MEMS/NEMS Devices and Applications.- Single-Walled Carbon Nanotube Sensor Concepts.- Nanomechanical Cantilever Array Sensors.- Microfluidic Devices and their Applications.- Microfluidic Micro/Nano Droplets.- Nanorobotics.- Applications of MEMS to Cell Biology.- Contact-free Mechanical Manipulation of Biological Materials.- Nano-Particles for Biomedical Applications.- Biological Molecules in Therapeutic Nanodevices.- Scanning Probe Microscopy - Principle of Operation, Instrumentation and Probes.- Low-Temperature Scanning Probe Microscopy.- Biomedical Sensing with the Atomic Force Microscope.- Superresolution Microscopy.- Nanotribology, Nanomechanics and Materials Characterization.- Surface forces and nanorheology of molecularly thin films.- Atomic Scale Friction Phenomena.- Computer Simulations of Nanometer-Scale Indentation and Friction.- Cellular Nanomechanics.- Mechanical Properties of Nanostructures and Scale Effects.- Nanotribology of Ultrathin and Hard Amorphous Carbon Films.- Self-Assembled Monolayers for Nanotribology and Surface Protection.- Nanoscale Boundary Lubrication Studies.- Plant Surfaces: Structures and Functions for Biomimetic Applications.- Bioinspired Nanostructured Anti-Biofouling and Anti-inorganic Surfaces.- MEMS/NEMS and BioMEMS/BioNEMS: Tribology, Mechanics, Materials and Devices.- Friction and Wear in Micro and Nanomachines.- Failure Mechanisms in MEMS/NEMS Devices.- Mechanical Properties of Micromachined Structures.- High Volume Manufacturing and Field Stability of MEMS Products.- Packaging and Reliability Issues in Micro/Nano Systems.- Nanotechnologies in Societal Context.- Environment, Health and Safety Issues in Nanotechnology.- Nanoscience and Nanotechnology Convergence.- Global Perspectives of Nanotechnology Education. Dr. Bharat Bhushan is presently an Ohio Eminent Scholar and The Howard D. Winbigler Professor in the College of Engineering, and the Director of the Nanoprobe Laboratory for Bio- & Nanotechnology and Biomimetics (NLB2) and affiliated faculty in John Glenn College of Public Affairs at the Ohio State University, Columbus, Ohio. In 2013-14, he served as an ASME/AAAS Science & Technology Policy Fellow, House Committee on Science, Space & Technology, United States Congress, Washington, DC. Bharat Bhushan is an internationally recognized expert of bio/nanotribology and bio/nanomechanics using scanning probe microscopy, and is one of the most prolific authors. He is considered by some a pioneer of the tribology and mechanics of magnetic storage devices. He is Co-Editor of Springer NanoScience and Technology Series and Co-Editor of Microsystem Technologies, and Member of Editorial Board of PNAS. He is the founder of an ASME Information Storage and Processing Systems Division founded in 1993 and served as its founding chair. He has received more than two dozen awards for his contributions to science and technology from professional societies, industry, and U.S. government agencies including Life Achievement Tribology Award and Institution of Chemical Engineers (UK) Global Award. He is also the recipient of various international fellowships including the Alexander von Humboldt Research Prize for Senior Scientists, Max Planck Foundation Research Award for Outstanding Foreign Scientists, and Fulbright Senior Scholar Award.